The Hamlin Companies is a 60 year old commercial roofing contracting, sheet metal fabricating and air flow measurement company. We are headquartered in Garner N.C. and provide construction services and construction products to the Southeastern U.S. and beyond. The Hamlin Companies offer excellent pay commensurate with experience and comprehensive job benefits that include medical, dental, vision, disability and life coverage, 401k, paid holidays and paid time off. The Hamlin Companies foster and encourage a teamwork environment that includes team goals and team incentives. Individuals who work well with others will excel at The Hamlin Companies. The Hamlin Companies believe in delivering high quality work at fair prices with integrated customer service that insures overall job performance and customer satisfaction. The Hamlin Companies currently have openings for welders, commercial roofers and sheet metal fabricators with all levels of experience. Welding experience is required. 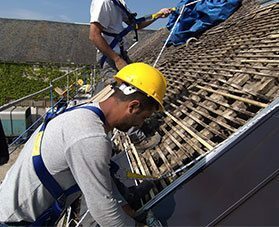 Commercial roofing or other construction experience is a plus for the roofing positions; however we are willing to train the right candidates who are dependable and willing to learn. Candidates must be legally able to work in the U.S. and pass a drug screening. Must have experience and be capable of performing a variety of welding functions including MIG and TIG light gage stainless, aluminum, and steel HVAC ductwork. Individuals must also be able to read and understand blueprints and machine drawings to determine specific welding requirements and insure that welds meet standards and specifications. Commercial Roofing Estimator: Primary function is to prepare estimates and proposals for commercial roofing projects. Paying attention to detail, as well as good math and organization skills are required. Prior roofing experience is an asset but not required as the applicant will be trained. Installing roofs on commercial structures with roofing products such as TPO, EPDM, modified bitumen, and BUR. Experience on installing commercial roofs is a positive but we will train the right candidates. Candidates must be able to climb ladders frequently and work on elevated roofing surfaces. Candidates must demonstrate a strong work ethic, a positive attitude and be a team player. Providing commercial roofing repair and maintenance services to building owners, property managers and facility managers. Knowledge of different roofing systems and experience in installing, repairing and maintaining commercial roofs is a requirement. A commitment to customer service, paying attention to detail, and demonstrated communication skills to insure customer satisfaction is also required. If your facility needs prompt work from qualified and highly-experienced commercial roofing contractors, contact Hamlin any time, 24/7.